Another view of the sun poking through. Visit Sky Watch Friday and hundreds of bloggers from all over the world sharing their view of the sky. Another amazing sun rays!<br /><br />Happy weekend. 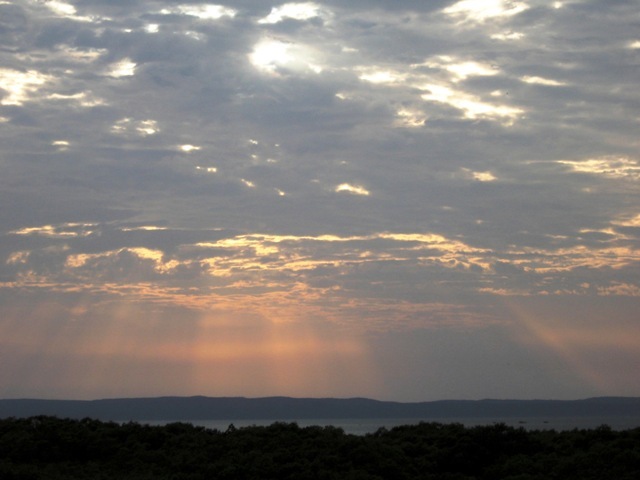 beautiful capture of the rays descending downward…just beautiful. I love the rays of sunshine, this is quite a good picture. the rays are very inspiring. enjoy the weekend. Oh, love the rays…you are so good at catching them…thanks for sharing. Wonderful shot. Awesome with the sun rays stretching down through the clouds. Thanks for sharing. The sun may have been just poking through, but it sure made for a lovely picture. I like this amazing sky photo. I always expect to hear a few words from God when I see a sky like this. Nice. The great spokes of light filtering through the cloudes. Great photo – Thanks. 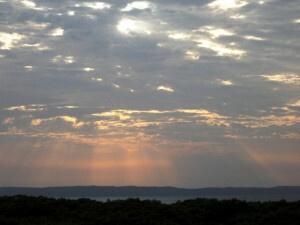 I love the heavenly beams, beautifully captured! Beautiful sky!<br />We need some sun rays! Sunshine rays at its best. Oh so very beautiful. I really love the softness of the colors. This is a great way to end my week. Thank-you. Seldom does one seeit poking through in pink. Lovely shot. Lovely rays, Pearl Maple. Thank you for capturing them and for sharing your shot. The Ralph Waldo Emerson is GREAT and so true. Beautiful pic! simply beautifully captured shot…lovely sunrays! Glowing orange crepusclar rays!!! LOVE IT! Great capture! Mandy, what a lovely blog!! I am a first time visitor and I really enjoyed exploring your lovely posts! It is a cold and rainy fall day here where I am so the beautiful beach skies were a nice reprieve.